Some people profiteered from the spill by charging BP outrageous rates for cleanup. Others profited from BP claims money, handed out in arbitrary ways. So many people cashed in that they earned nicknames — “spillionaires” or “BP rich.” Meanwhile, others hurt by the spill ended up getting comparatively little. Fire boat crews battle the blazing remnants of the Deepwater Horizon in the Gulf of Mexico, April 21, 2010. In the end, BP’s attempt to make things right — spending more than $16 billion so far, mostly on claims of damage and cleanup — created new divisions and even new wrongs. Because the federal government ceded control over spill cleanup spending to BP, it’s impossible to know for certain what that money accomplished, or what exactly was done. Some of the influx of money can be traced to the efforts of St. Bernard’s parish president, Craig Taffaro Jr., a 45-year-old psychotherapist with a wrestler’s build, a cue-ball head and a trimmed goatee. Just days into the crisis, Taffaro did what many parish presidents did: He invoked a Louisiana law that allowed him to declare a 30-day emergency and handle the crisis without most normal government checks and balances. But Taffaro used his powers more broadly than most, saying that he wanted to put money back into the community. Unlike the leaders of other Gulf communities, Taffaro — not BP — chose the prime contractor that supervised the cleanup. He and his allies also decided which fishermen would be hired to put out boom and search for oil. At one point, Taffaro hired his future son-in-law to work in the finance department and help on the spill. In some ways, parish residents seemed to view the disaster and BP’s culpability as a way to recover from earlier blows. More than other coastal communities, St. Bernard bore the brunt of Hurricane Katrina, which flooded almost every home in August 2005. The population dropped almost in half, from about 67,000 in 2000 to about 36,000 in 2010, largely because people didn’t come back after Katrina and the hurricanes that followed. Before the spill, the parish slashed its budget by 11 percent, cutting garbage collection, the fire department and mosquito control. There was just no money. The parish government was among the first to benefit, snagging a $1 million check for oil-spill expenses. Parish employees went shopping for cameras, printers, a file cabinet, staplers, six pairs of children’s scissors and 712 shirts emblazoned with the parish name. Some of the money also went to overtime pay for more than 40 parish employees, including three who claimed overtime for picking up dog food for the animal shelter. St. Bernard’s homeland security director, David Dysart, a salaried employee and Taffaro’s good friend, was paid almost $23,000 for working 497 hours of overtime in less than seven weeks. That meant he was working an average of more than 16 hours a day, including weekends. As the money flowed, complaints spread. Some beneficiaries didn’t necessarily suffer from the spill but had social or political connections. Subcontractors said those at the top of the cleanup creamed off money for doing very little, while those at the bottom earned much less for doing the actual work. Meanwhile, Taffaro was attacking BP and the federal government in the media, appearing on TV alongside Gov. 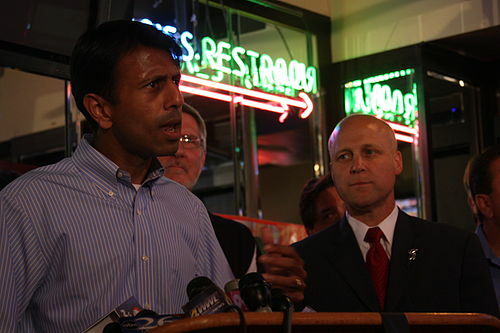 Bobby Jindal and testifying in Congress. His outrage was palpable. There wasn’t enough boom, coordination or respect for the local government. BP wasn’t making good on its obligations. BP gave only limited information to ProPublica, and declined to comment on allegations it had been overcharged. The U.S. Coast Guard, the federal agency most involved with overseeing BP’s response, said the government and BP decided cleanup priorities together. Taffaro and other St. Bernard officials refused to respond to the public-records requests ProPublica began filing in November. When asked again last week why the parish hadn’t provided any records, Dysart said he would be happy to help but that filling the request would take time and cost a lot of money. “I’m in the process of really, truly trying to assist you,” said Dysart, who is also the parish interim chief administrative officer. Taffaro also said that the tax receipt bubble was “a false economy,” similar to what happened after Hurricane Katrina. Amigo Enterprises Inc., which for years leased land to one of the busiest marinas in the parish, got in early. BP based the cleanup operation at the marina in Hopedale, which made sense. But the price Amigo charged BP for the land was astronomical. Amigo had been leasing the land for less than $1,700 a month from the Arlene & Joseph Meraux Charitable Foundation Inc., according to the nonprofit’s most recent tax returns. 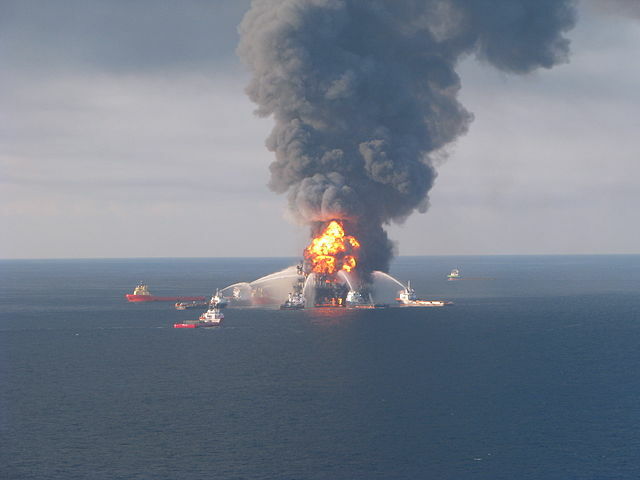 The company billed BP more than $1.1 million a month, said BP spokesman Joe Ellis. Amigo wasn’t just any company. One of the owners was St. Bernard’s powerful sheriff of 26 years, Jack Stephens, who also sat on the board of the Meraux Foundation. According to the most recent ethics form Stephens filed with the state, he earned more than $100,000 from Amigo in 2009. Stephens’ cousin Anthony Fernandez Jr., also Stephens’ former chief deputy and one of his two partners in Amigo, said BP paid less than $1 million a month to Amigo for rent, but refused to say how much. Fernandez also got a chunk of BP money for another company, Parish Oilfield Services LLC. That company hired off-duty sheriff’s deputies to provide security for the spill, charging BP $45 an hour per deputy, Ellis said. The normal off-duty rate for the deputies is $30 an hour, according to the sheriff’s office. The company that benefited most from BP’s checkbook was Loupe Construction and Consulting Co., Inc., a small, family-owned business in a nearby parish with few employees and a bare-bones website that misspelled the company name. On May 5, Taffaro chose Loupe to manage the cleanup in St. Bernard, a job that would eventually be worth as much as $125 million. Taffaro said he selected Loupe after asking for proposals from several companies and because of its disaster experience. He also said he thought the company had experience responding to oil spills. The decision didn’t sit well with some people. In other Louisiana parishes, BP chose the lead cleanup companies, all of them certified by the Coast Guard as official Oil Spill Response Organizations, meaning they had some experience responding to spills. But Loupe didn’t have that certification. In fact, the company that would eventually manage more than 50 subcontractors and 150 vessels had no oil-spill experience at all. Its main job in St. Bernard had been helping rebuild levees. Coast Guard Commander Dan Lauer said he wasn’t familiar with what happened in St. Bernard Parish, but said he would “absolutely” want a certified company as prime contractor in a major oil spill. “I guess they figured they were stuck with us,” said Randy Nunez, a lawyer for Loupe, adding that the company had taken “a leap of faith” by starting work without official BP approval. Owner Paul Loupe had a long history of debts and lawsuits. Four lawsuits, three of which have been settled, accused him of not paying his bills after Katrina and Hurricane Rita, when he and another small Louisiana company joined up to clear debris in nearby Jefferson Parish, the company’s only major experience responding to a disaster. Loupe’s website says the two companies performed more than $100 million worth of work  for Ceres Environmental Services Inc., the Minnesota-based company that hired them. But much of that work was actually performed by layers of subcontractors, which is why Loupe was accused of being one of the “pass-through” companies that proliferated after the hurricanes. Workers at the bottom of the contracting chain earned so little for debris-removal work that the U.S. Department of Labor later ordered Ceres to pay $1.5 million in back wages  to more than 2,000 laborers. Paul Loupe referred questions to his lawyers. One, Karl Dix, said everyone was happy with Paul Loupe’s work. “He worked tirelessly during that effort and really accomplished a lot,” Dix said. After Loupe was picked, there was a feeding frenzy to get hired by the company, which operated out of a family compound about an hour from St. Bernard. People with little connection to commercial fishing used old boats or bought new ones and signed up to work. Companies from Washington state, Nevada and Mississippi came to town. Contracts were fought over. Everyone wanted a piece, just as they did after Hurricane Katrina. Only this time, the federal government wasn’t footing the bill; a reviled corporation was, and the prices reflected that. “They used to hide it behind the docks over there, and it never worked,” Campo said. In July, Loupe hired a Washington state company, Farrow Construction Specialties Inc., to set up marsh-washing systems on barges. Almost immediately, a Farrow consultant named Larry Howell, who had once pleaded guilty to a federal bank fraud charge , set up his own company with people from South Carolina, Texas and Arizona to take over the Farrow contract. Workers contracted by BP clean up oil on a beach in Port Fourchon, La., May 23, 2010. In setting up his new company, Howell turned to family as well. One subcontractor he hired was a small Mississippi company run by his mother’s brother-in-law. It charged Howell $15,400 per month to rent each of three generators, which usually each went for $1,500 a month. It charged more than $18 a foot for wire that other contractors said cost at most $4 a foot, and charged $3 a mile for 2,240 miles of travel when the IRS standard business rate was 50 cents. The company also billed Howell more than $14,000 for 140 hours of labor to set up a single generator, a job that other contractors say should take only a few hours. Howell passed all those charges up to Loupe and BP. “I spilled my guts. So now, it’s my understanding they are being investigated,” said Turner, referring to the parish and the businesses that were hired for the cleanup. The FBI agent declined to answer questions for this story. Howell couldn’t be found for comment. The company he helped form moved out of its office in December without giving notice. As the cleanup dragged on, Loupe faced a cash-flow problem. For help, Loupe turned to Park Investments Ltd., a local company that primarily develops shopping malls and other commercial properties. Park Investments and its related companies had done business with plenty of parish powerbrokers in the past — Stephens, the sheriff, had been a partner in at least one development. At a 2009 fundraiser for Taffaro, Park Investments gave $2,500, the legal limit in Louisiana. Three other businesses formed by Frank and Georgusis or their businesses — they’ve been involved in at least 15 over more than 20 years — contributed $2,500 each. Georgusis contributed $2,500. So did Georgusis’ wife, Cheryl. In essence, the cleanup company chosen by Taffaro was now being financed by some of Taffaro’s biggest supporters. “If you’re trying to link something, the link doesn’t exist,” Frank said. On Aug. 21, Loupe delivered 139 invoices to Louisiana’s main incident command post in Houma — the first time the finance team said it had seen any of the invoices. All told, Loupe claimed BP owed it $34.7 million. Over the following week, BP’s finance team reviewed the 55 largest invoices. Team members found that all the invoices lacked information showing that BP had authorized the goods or services. All also lacked supporting documentation like timesheets. One in five had basic errors and omissions, such as differing daily rates for the same vessels, double-billing for the same equipment, and math errors. Meanwhile, Loupe officials were demanding payment, and Taffaro was calling BP over the impasse. Despite the fact that the well was plugged, Taffaro declared another 30-day emergency — his last — meaning that for another month, he still controlled the cleanup. 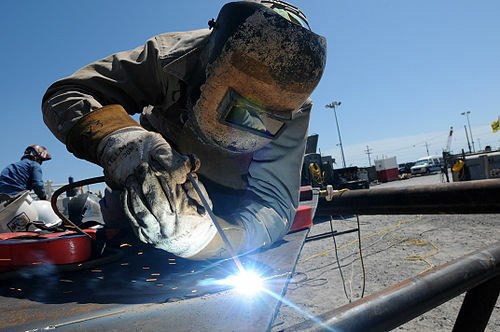 A welder fabricates a portion of the BP subsea oil recovery system chamber at Wild Well Control, Inc. in Port Fourchon, La., April 26, 2010. The meeting, agreement and invoice problems were outlined in a letter sent by the chief operating officer of BP’s Gulf Coast Restoration Organization to Paul Loupe. The letter, obtained by ProPublica, was also sent to Taffaro. “As we discussed at the meeting, all of the invoices reviewed to date lack certain critical information that, in accordance with well accepted business practices and BP’s code of conduct, BP requires before it can approve an invoice for payment,” the letter said. BP also began balking at other bills. Parish Oilfield claimed to be owed $900,000 for sheriffs’ deputies, BP’s Ellis said. At $45 an hour, that meant the deputies had clocked as many as 20,000 hours since the spill. If Parish Oilfield pocketed $15 for every hour worked — given that the normal off-duty deputy rate was $30 an hour — that would have meant $300,000 for the company itself. Within days, the spill cleanup ground to a halt. Amigo refused to provide fuel for the cleanup. So did Campo at Shell Beach and another fuel dock on Delacroix Island, because Loupe hadn’t paid past bills. On Aug. 31, the sheriff’s office signed an eviction notice for BP at the Hopedale site because BP had not paid rent to Amigo. “Landlord wants possession of his property,” the notice said, without clarifying that the sheriff’s company was the landlord. That night, Taffaro held a press conference, highlighting the eviction notice and accusing BP of not paying its bills, including more than $3 million owed to Amigo and more than $34 million owed to Loupe. “We are calling on BP to step forward to make this right,” Taffaro said. While contractors fought for BP’s cleanup money, commercial fishermen jockeyed for BP-financed jobs to replace their lost income. 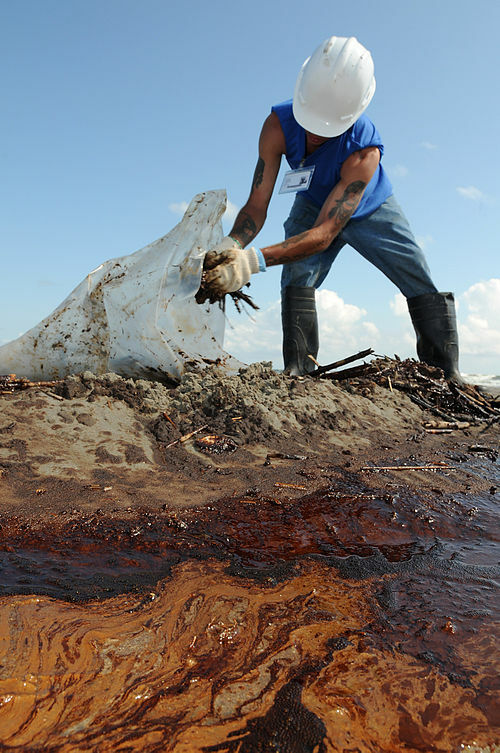 A worker cleans up oily waste on Elmer's Island, just west of Grand Isle, La., May 21, 2010. As long as oil poured into the Gulf, the fishermen were unable to work and unqualified for most other jobs. Some went on anti-depressants. Others started drinking too much. Nearly all tried to join BP’s “Vessels of Opportunity” program, which was supposed to provide a lifeline for commercial fishermen by hiring them and their boats for cleanup work. Boats could make $1,200 to $3,000 a day. Crew members often earned $200 a day, while captains earned as much as $360 a day. Using his emergency powers, Taffaro set up St. Bernard’s version of Vessels of Opportunity. Now Taffaro, not BP, controlled who got the coveted jobs. David Dysart, the homeland security director, said the jobs were handed out fairly through a public lottery. But a ProPublica reporter attended a meeting where Taffaro gave a job to a seafood dealer without a drawing. And dealers complained repeatedly that they weren’t listened to when it came to hiring the parish’s top fishermen. State officials also said the parish didn’t follow up on an early request for a list of top fishermen. Soon after the cleanup began, commercial fishermen also started complaining that a small group of favorites got more work than anyone else. ProPublica’s analysis of parish checks paid to fishermen over the first six weeks, filed as part of a court case, seems to bear that out. A small group worked regularly, earning $24,000 to $34,000. Although Taffaro and Dysart said those fishermen performed additional jobs, the same fishermen got and kept those additional jobs throughout the entire cleanup. Meanwhile, Eric Melerine, a top fisherman from Delacroix Island, earned only $5,260 during those first six weeks. His younger brother Jason, also a full-time commercial fisherman, earned just $4,560. Another fisherman, Donald Campo, failed to get hired on the BP cleanup at all, despite signing up. Knowing Taffaro was key to getting hired, fishermen said. Kim Alfonso said he was initially told he couldn’t get his crab boat on the job. He protested. Cisco Gonzales, who owns an air-conditioning company and runs the Louisiana Crawfish Festival, got his boat on the cleanup by lending it to his nephew, a fisherman whose own boat broke down. Many fishermen complained about Gonzales earning money from the spill, especially fishermen who couldn’t get a boat hired. Gonzales said he felt bad about all the animosity against Taffaro. On June 1, fishermen showed up at a council meeting to complain about the selection system. They complained that some fishermen worked seven days a week, while others hadn’t worked in 30 days. Stacy Campo, a fisherman’s wife, said the inequities were ripping apart the community. “Not a problem,” Taffaro replied. The system featured bizarre incentives and rules. It didn’t differentiate between those who got cleanup jobs with BP and those who didn’t. The amount people received for their initial six-month emergency claims was based on whatever paperwork they decided to submit, not on their actual losses. The final claims formula seemed to reward fishermen who stayed home after the government fishing bans were lifted and punished fishermen who returned to work. Jason Melerine, 28, who said his income was about $90,000 in 2009, received a six-month emergency compensation check for $180,000. To support his claim, he submitted invoices showing that his boat sold $280,000 worth of seafood the year before, an amount that didn’t reflect his expenses. Eric Melerine’s deckhand Mikey Labat, who made about $70,000 in 2009, initially received $6,900 for his six-month claim. His wife, Laura, was so upset that she filed an appeal and got the family another $18,000. Later, after hearing rumors of waitresses and hairdressers earning big money, she said she went to the claims office and sarcastically asked if she could file her own claim because her husband wasn’t paying her an allowance for cooking and cleaning. “They said, ‘Go ahead, file a claim,'” Laura Labat said, adding that she didn’t. Many fishermen fretted that businesses that were suffering from the recession, not the spill, were getting BP money. A hairdresser at Dorene’s hair salon received $8,000 for her emergency claim. Waitresses at the World of Wings Café and Wingery received between $5,000 and $7,000; the restaurant’s owner got $50,000. A valet car parker at a five-star hotel in New Orleans that was 98 percent full received $1,000. Felesia Carter, a manager at St. Bernard’s only off-track betting parlor, said she heard customers talking about how they were gambling away claims money. Her business was so good, she said, that employees worked overtime and weren’t allowed to file for claims. In September, Randy Nunez, one of Loupe’s lawyers, invited people to an event hall in New Orleans’ historic warehouse district to raise money for Craig Taffaro’s re-election campaign, two invitees said. Nunez did not return later calls from ProPublica. The stakes are high for the October election, because the parish council recently bumped the next president’s salary from $70,000 to $128,000, a hefty sum in a community with a median household income of about $38,500 a year, about $13,500 below the national median. More than 200 people showed up for the fundraiser at The Chicory, including Paul Loupe and his wife, witnesses said. Records filed by Taffaro’s campaign committee show that he pulled in $207,400 — more than his combined donations from the previous two years. No other president or presidential candidate in St. Bernard has ever reported raising that much money in a single night, according to Louisiana records available online. At least $45,800 of that money came from people and companies that ProPublica has linked to the cleanup effort, including Loupe, Nunez’s law firm, Park Investments and people and businesses connected to Park. The amount is likely higher than that, but no list of companies that worked on the spill is available for comparison with Taffaro’s campaign filings. Loupe is now enmeshed in a battle with BP over what it says it is owed. As of November, the last time the company’s lawyers spoke to ProPublica, Loupe had been paid $25 million, but it claimed to be owed $100 million more. Some contractors in other parishes claim that BP owes them millions, too. Is BP shortchanging contractors? Are contractors trying to scam BP? Because none of the records are public, it’s impossible to know for sure. ProPublica’s research director, Lisa Schwartz, and researchers Kitty Bennett, Sasha Chavkin and Liz Day contributed to this report. NextIs Air Quality in the U.S. Improving or Getting Worse? The “Production Tax Credit” for Renewal Energy Development.